Like most of the top athletes that have gone through the Lamorinda school system, Haley Van Dyke grew up playing many sports. Up through seventh grade, Van Dyke played soccer and volleyball, which she says, "I enjoyed but it was not as challenging as basketball." It was in eighth grade that Van Dyke chose to make basketball her main sport as she explained with great understatement: "I tried basketball and found I was not too bad at this and just kept going with it." 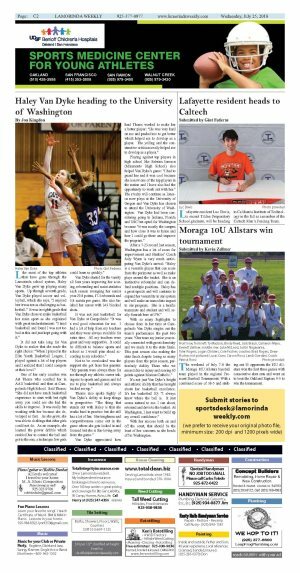 It did not take long for Van Dyke to realize that she made the right choice: "When I played in the Elite Youth Basketball League, I played against a lot of top players and I realized that I could compete at their level." One of her early coaches was Art Thoms who coached her in AAU basketball and then at Campolindo High School. Said Thoms: "She did not have much basketball experience to start with but right away you could see she had the skills to improve. It was really fun working with her because she developed so fast. As she grew, she was able to do things that other girls could not do. As an example, she learned the power dribble which enabled her to control the ball and get to the rim, a technique few girls could learn so quickly." Van Dyke started for the varsity all four years improving her scoring, rebounding and assist statistics each season averaging her senior year 29.8 points, 17.3 rebounds and 3.8 assists per game. She also finished her career with 343 blocked shots. It was not just basketball for Van Dyke at Campolindo: "It was a real good education for me. I had a lot of help from my teachers and they were always available for extra time. All my teachers were great and very supportive. It could be difficult to balance sports and school so I would plan ahead according to my schedule." Not to be overlooked was the support she got from her parents: "My parents were always there for me through my athletic career taking me to sports and games and led me to play basketball and always backed me up." Thoms also spoke highly of Van Dyke's ability to keep things in perspective: "The thing that stands out with Haley is that she works hard in practice but she still has a lot of fun. Her toughness and competitiveness come out in the game where she gets locked in and focused but she is fun-loving away from the game." Van Dyke appreciated how hard Thoms worked to make her a better player: "He was very hard on me and pushed me to get better which helped me to develop as a player. The yelling and the constructive criticism really helped me to develop as a player." Playing against top players in high school like Sabrina Ionescu (Miramonte High School) also helped Van Dyke's game: "I had to guard her and it was cool because she is now one of the top players in the nation and I have also had the opportunity to work out with her." The rivalry will continue as Ionescu now plays at the University of Oregon and Van Dyke has chosen to attend the University of Washington. Van Dyke had been considering going to Indiana, Florida and USC but opted for Washington because "it was mostly the campus and how close it was to home and how I could go there and improve the program." After a 7-23 record last season, Washington has a lot of room for improvement and Huskies' Coach Jody Wynn is very much anticipating Van Dyke's arrival: "Haley is a versatile player that can score from the perimeter as well as make plays around the basket. She is an instinctive rebounder and can defend multiple positions. Haley has a great upside and will continue to expand her versatility in our system and will make an immediate impact to our program. She is a terrific teammate and student and will really flourish here at UW." 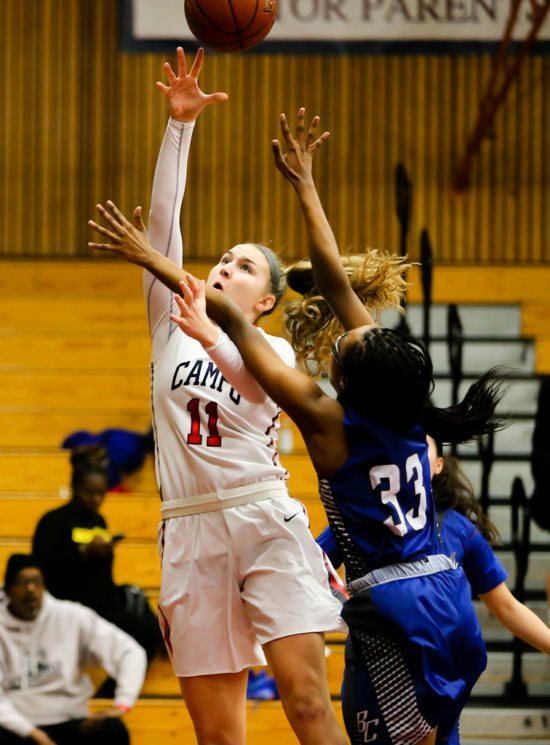 With so many highlights to choose from in her time at Campolindo Van Dyke singles out the team's performance the past two years: "Our team my junior year really connected with great chemistry and we made it to the state finals. This past season also making the state finals despite losing so many players from the prior season, particularly Ashley Thom who we missed due to injury and scoring 60 points against Moreau Catholic." It's not just Van Dyke's height and athletic ability that has brought about her basketball excellence. It's her basketball IQ: "I always knew where the ball is. It just seems natural to me. I can shoot, rebound and drive to the basket. At Washington, I just want to build up my overall confidence." With her success both on and off the court, that should be the least of her concerns as she heads off to Washington.